See popular highlights of the Southwest on a 3-day national parks tour from Las Vegas. Discover the amazing landscapes of Zion National Park and visit Grand Canyon National Park, where you can hike, walk along the South Rim or go on an optional helicopter ride. You'll also experience a Navajo-guided Jeep tour of Monument Valley. Take an optional tour of Antelope Canyon and see Horseshoe Bend. Hear insightful commentary from your knowledgeable guide with transportation by air-conditioned minibus, select meals and entrance fees included. This small-group winter tour is limited to 14 people for a more intimate experience. This 3-day tour takes you to top national parks in the US. Take lovely hikes, capture stunning photos, and admire unforgettable views of the Grand Canyon and Zion, plus Monument Valley. An optional tour of Antelope Canyon (own expense), and a visit to Lake Powell will be a highlight to this tour. Enjoy comfortable hotel accommodations and transportation by minibus. After leaving Las Vegas, travel 280 miles (450 km) through the Mojave Desert and via historic Route 66 to Grand Canyon National Park's South Rim. Discover this remarkable natural wonder on your own once you arrive and enjoy lunch. Admire the complex layers and myriad colors of the canyon from rim overlooks, hike down into the staggeringly deep canyon, and capture fantastic photos as sunset illuminates the full beauty of the rock formations. Opt to take a thrilling helicopter ride (own expense) over the canyon for more unforgettable views. Relax over dinner (own expense), and settle down for the night at your comfortable hotel in Williams or Tusayan. After breakfast (own expense), make a quick stop at a traditional Navajo trading post to shop for local crafts. Then follow the Colorado River through the captivating Painted Desert to Monument Valley, an iconic film setting seen in many western films. Climb aboard a 4x4 vehicle for a Navajo-guided jeep tour packed with stunning photo ops. After your sandwich lunch, continue to Page overlooking placid Lake Powell. 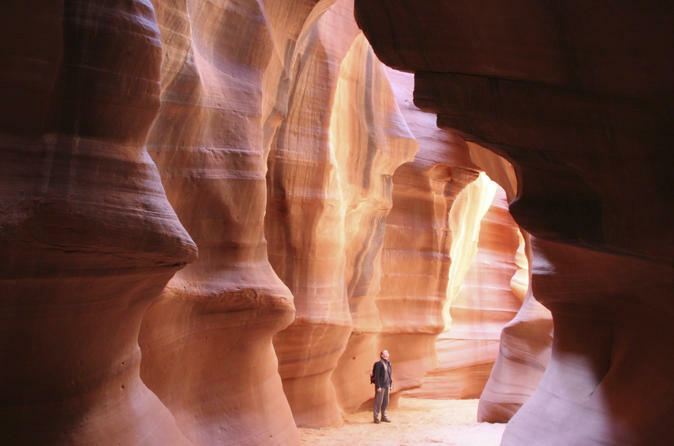 Opt to take a tour of Antelope Canyon (at own expense), a brilliantly hued slot canyon. Enjoy dinner (own expense) before retiring to your hotel room. Day 3: Lake Powell – Zion National Park – Las Vegas (B, L) Start your day with breakfast at your hotel before heading to Horseshoe Bend — a distinctive curve of the Colorado River. Make a photo stop at Lake Powell before going on to Zion National Park, a lovely collection of photogenic white, pink, and red sandstone cliffs cut by the Virgin River. Recharge with your sandwich lunch before heading out on a hike to an emerald pool or around the easy Pa'rus trail. Admire the monolithic Great White Throne and Weeping Rock, or listen to a ranger's talk at the Zion Human History Museum. Climb aboard your minibus for the ride back to Las Vegas where your 3-day winter odyssey concludes in the evening.